An hour east of Seattle, Washington is the luxury hotel that I have dreamed of visiting for several years since I first saw a photo of it. I’ve recently been traveling in the Pacific Northwest and I decided to make it happen – my relaxing getaway at the Salish Lodge was beyond everything I’d hoped for. Read on California residents…. you too Vancouverites! 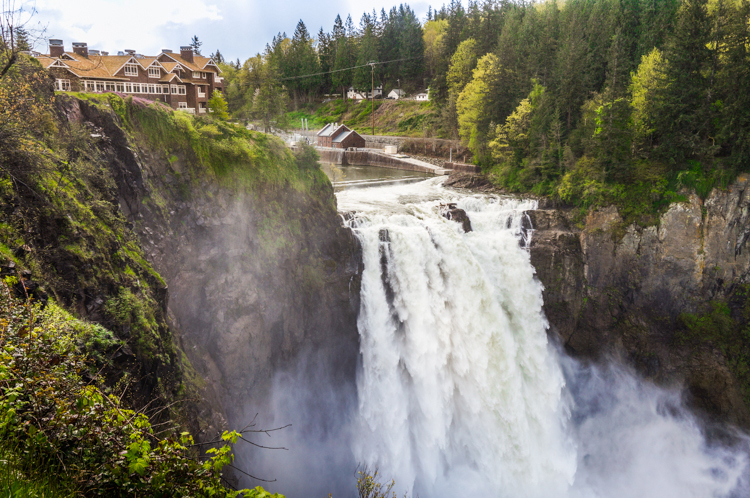 Located directly on top of a huge 268-foot waterfall, Snowqualmie Falls in fact, this hotel and spa boasts 84 guest rooms nestled right in the middle of nature. 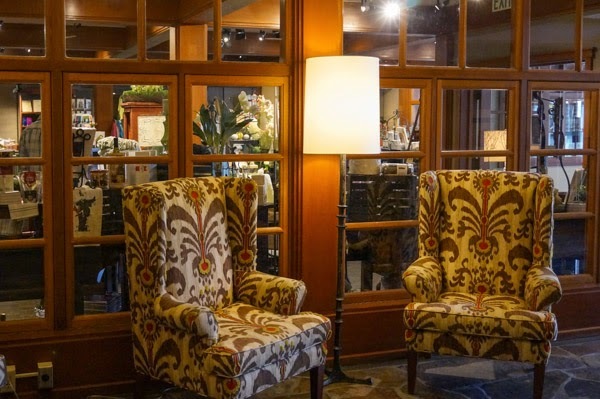 It has generated lists of accolades each year; Travel & Leisure included it on the list of Best Hotels in the World, Evening Magazine’s Best of Northwest Escapes called it the #1 Best Romantic Hotel. Condé Nast Traveler has rated it #29 in “Top 50 Hotels and Spas in the United States” and #9 out of the Top Hotels in the Pacific Northwest. Do you remember the 90’s hit television drama Twin Peaks? This is the area where a lot of the show was filmed. 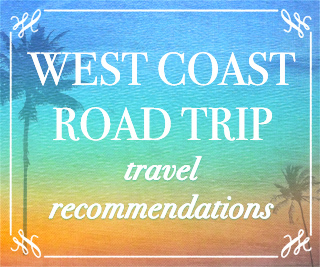 It is also just a 3 hour drive from Vancouver, BC or Portland, Oregon. Winter activities bring a chance to ski or snowshoe at nearby Snowqualmie Pass, while spring and summer make it a great chance to go wine tasting, hiking, kayaking or fishing. For me, it was all about relaxing!! At the front desk, I felt like I was being greeted at a family lodge. There was nobody else around and the roaring fireplace, oversized chairs and cozy pillows were a nice change from the brisk, drizzly Washington air. The fragrance in the air is one I still can’t forget; I believe it is cedar and lemongrass. 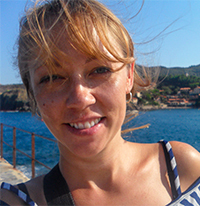 The atmosphere immediately relaxed me, which is rare, because it usually takes me a day or two to wind down from months of intense work schedules. 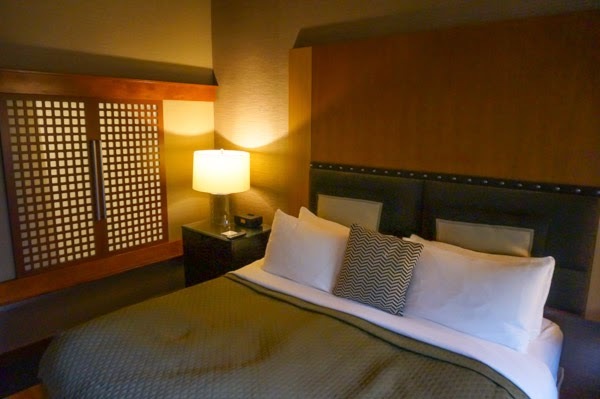 That really is what makes this place amazing – you’re completely relaxed from the moment you arrive. 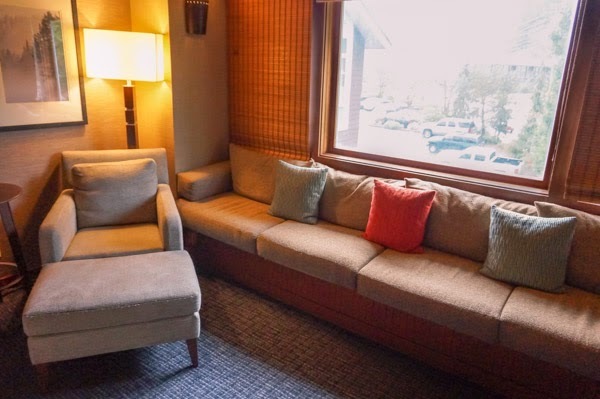 Other common areas are designed to make you truly comfortable. 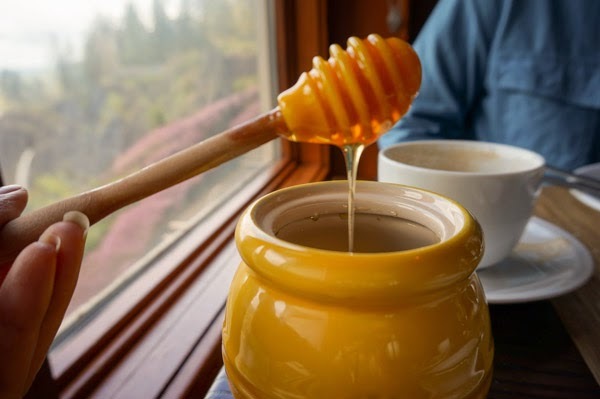 The gift shop features locally produced honey products, natural candles made in the northwest and rustic charm. 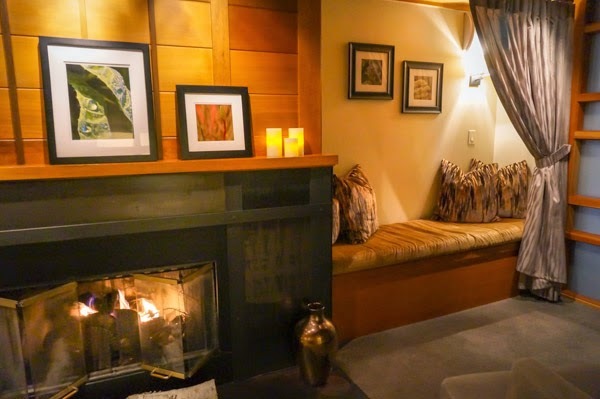 The guest leisure room is where you can bring your coffee, hot chocolate or wine, snacks, whatever suits you, and relax in front of the fireplace. There you can read a book (many provided in case you forgot yours) or get silly with one of their board games. 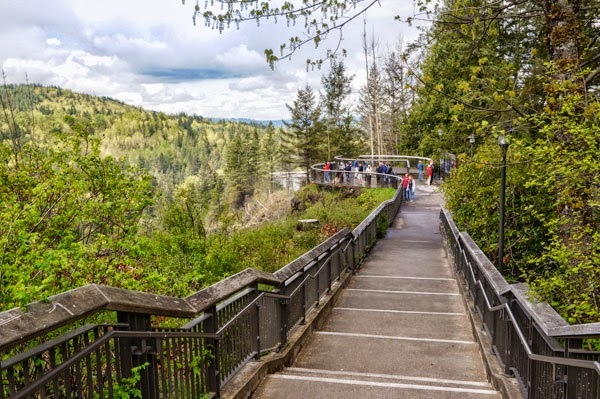 Just a few short steps from the hotel’s entrance is Snowqualmie State Park and two viewing platforms from which to see and photograph the majestic Snowqualmie Falls. The falls are illuminated at night and are a particular treat for guests; a favorite of mine for sure. For a really unique view, check out this clip of the falls as filmed by drone pilot Andrew Davis, it’s pretty amazing. My room had fantastic amenities including a gorgeous slate wood-burning fireplace, a ridiculously cozy bed, one wall of windows above an extended window seat. The fine details go beyond what you’d expect of a luxury hotel; custom built furniture, high speed wifi, his and hers bathrobes and slippers, gourmet coffees and teas, mini fridge, lavender and mint soothing toiletries, an oversized jacuzzi tub and rainfall shower…. but most importantly, they have a PILLOW MENU. Hold the show. WHAT? You heard me correctly. I called up room service and took advantage of this within mere seconds! 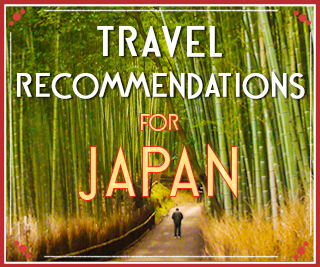 Buckwheat Pillow has therapeutic qualities recognized for centuries in Japan and the Far East. Buckwheat hulls mold to your neckline to allow complete relaxation of your head, neck and shoulder areas. Body Pillow is 50% goose down and 50% goose feather, some find very comfortable to curl up with. Memory Foam Pillow is non-allergenic and molds to your head. Pregnancy Pillow has a wedge design to lift and support the abdomen area. 100% Synthetic Pillow which is hypoallergenic for guests with allergies. Some other nice touches are the evening turndown service where they light your wood-burning fireplace for a cozy evening and the newspaper just outside your door every morning. 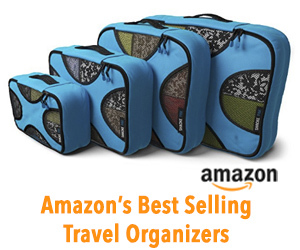 This is also a dog friendly hotel with specific rooms for guests traveling with four-legged friends. 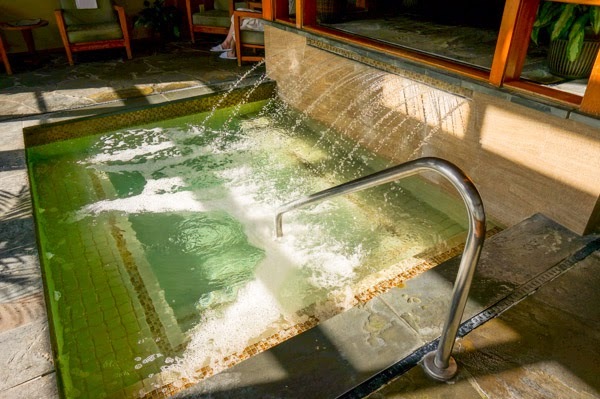 The spa is extensive with a gift shop, massage rooms, full service salon, cozy relaxation lounge with a fireplace and a eucalyptus steam room. 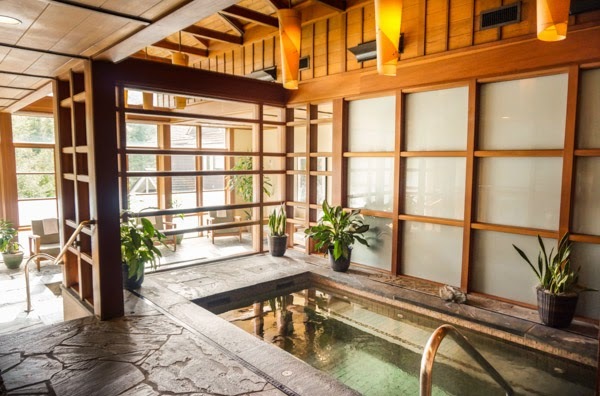 Condé Nast Awarded this spa the #11 spot on a list of the Top Hotel Spas in the US. The highlight for me was the two therapeutic soaking pools. The top pool is serene and the lower pool has a waterfall of it’s own. 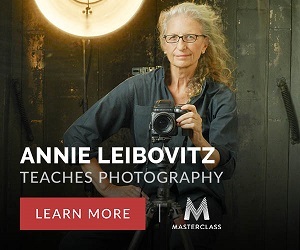 Folks, this right here is where your tense neck and shoulders are going to be relieved. Yeah, those sore shoulders from sitting in front of a computer for hours… this is going to help ease the tension. All dining at this hotel features what they call Northwest Cuisine and features seasonal ingredients and unique cooking techniques. 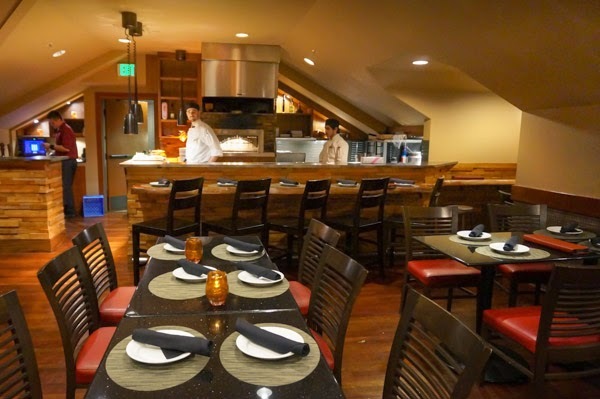 I had dinner at the more casual of their two dining facilities, The Attic Restaurant. The Attic’s prized showpiece is their new Washington applewood fired pizza oven, fresh cheeses from nearby River Valley Cheese and an extensive happy hour menu, including the Salish Honey Ale. 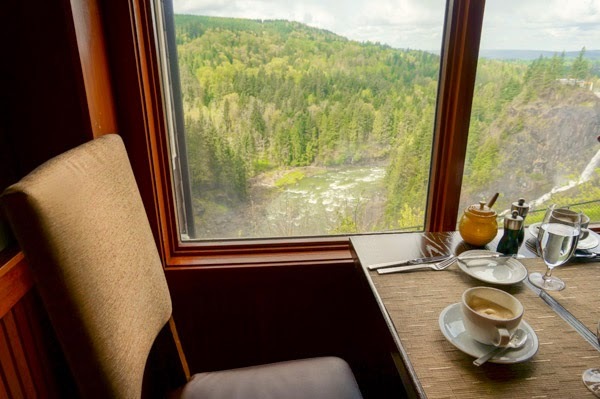 The Salish Lodge invited me to breakfast at The Dining Room where I was given arguably the best seat in the place (photo below). I was dining directly above the waterfalls as rainbows came and went…. truly mesmerizing. The menu offered omelets with fresh vegetables and unique dishes such as Belgian Waffles with warm apple butter, cinnamon whipped cream and maple syrup, or Lavender Brioche French Toast with candied hazelnuts, maple syrup and orange marmalade. Salish honey in the gift shop; looks like jewels, doesn’t it? 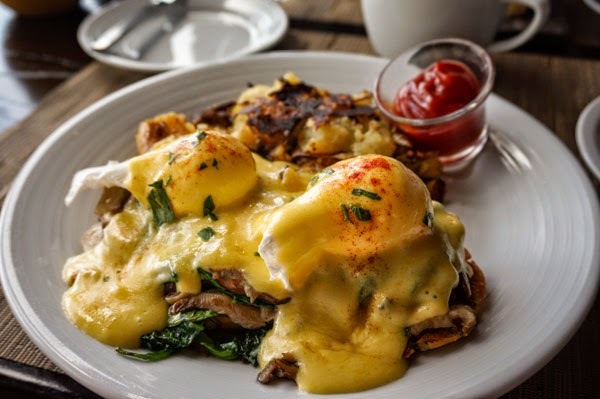 Eggs benedict with lemon hollandaise, toasted english muffin, tomatoes, spinach, mushrooms and crispy hashed potatoes. 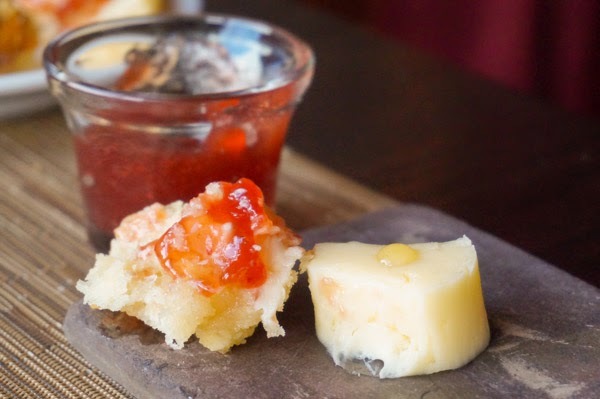 Biscuits and jam at breakfast, with sweet butter served on rustic stone slate. 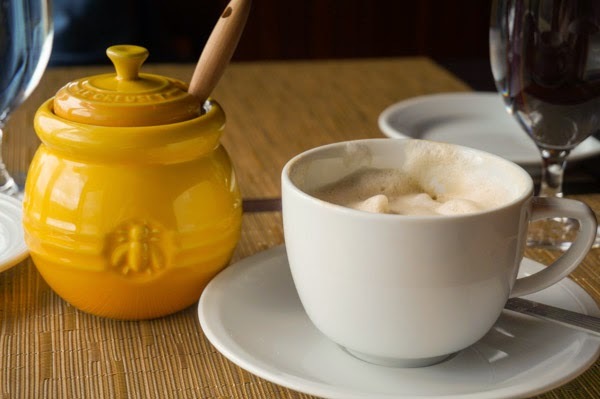 Breakfast cappuccino and Salish honey. 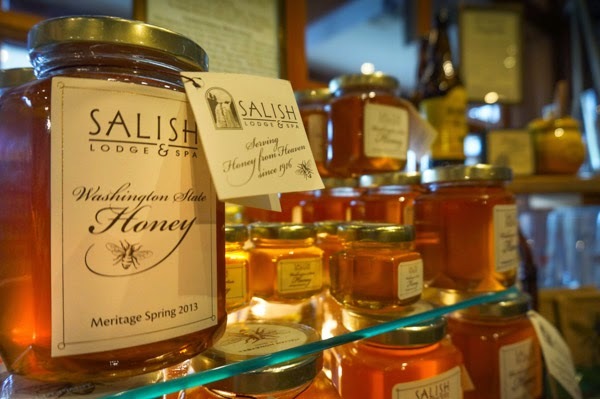 That great Salish honey goes perfect with the buttermilk biscuits. Seating area in the lobby with the gift shop just behind. Huge window seat in my hotel room at Salish Lodge. Relaxation pool in the Salish Spa. Waterfall was truly the perfect massage for my tense shoulders. Lounge at the Salish Spa. Warm and cozy. 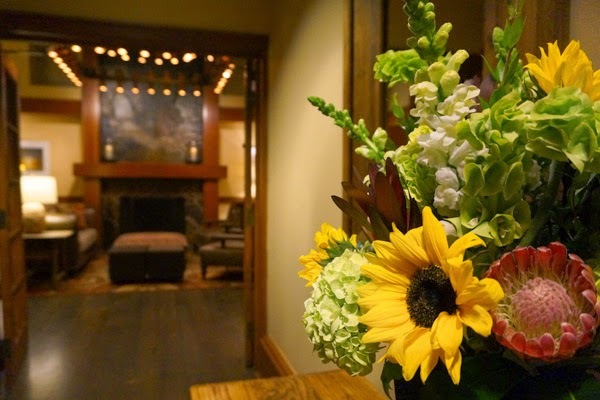 I hope you get a chance to unwind at the Salish Lodge; it could be the getaway you’ve needed. 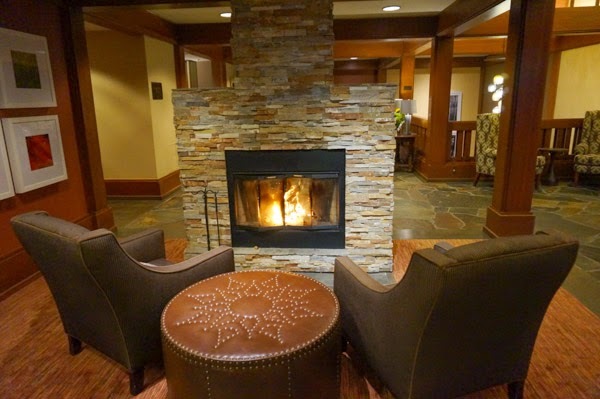 Check rates for the Salish Lodge on Expedia. Sometimes they have specials so don’t forget to check the Salish Lodge official Website if you’re planning a visit.